Josip Broz Tito (Cyrillic: Јосип Броз Тито, May 7, 1892 – May 4, 1980) was the chief architect of the "second" Yugoslavia that lasted from 1943 until 1991. Tito is best known for organizing anti-fascist resistance movement Yugoslav Partisans, defying Soviet influence (Titoism), and founding and promoting Non-Aligned Movement worldwide. He broke with the Soviet Union in 1948 and enjoyed good relations with the Western powers, who sold him arms to defend Yugoslavia from possible attack from the USSR. Tito was able to build one of the largest armies in Europe. During his long rule, the provinces of Yugoslavia were treated equitably and regionalism was discouraged although cultural identity could be freely expressed. The particular brand of communism that Tito espoused was known as ‘market socialism’, with workers rather than the state owning the means of production while the market is allowed to determine production and pricing. Yugoslavia was economically better off than most other Communist states. Following his death, however, Yugoslavia only survived as a federation for a decade before its republics declared independence and war around territorial claims especially involving Croatian and Serbian claims on Bosnia quickly followed. 1.1 Origin of the name "Tito"
Tito died on May 4, 1980 in Ljubljana hospital of post-surgery complications. Josip Broz Tito was born in Kumrovec, Croatia, then part of Austria-Hungary, in an area called Zagorje. He was the seventh child of Franjo and Marija Broz. His father, Franjo Broz, was a Croat, while his mother Marija (born Javeršek) was a Slovenian. After spending part of his childhood years with his maternal grandfather in Podsreda, he entered the primary school in Kumrovec, and failed the first grade. He left school in 1905. In 1907, moving out of the rural environment, Broz started working as a machinist's apprentice in Sisak. There, he became aware of the labor movement and celebrated May 1 - Labor Day for the first time. In 1910, he joined the union of metallurgy workers and at the same time the Social-Democratic Party of Croatia and Slavonia. Between 1911 and 1913, Broz worked for shorter periods in Kamnik, Slovenia, Cenkovo, Bohemia, Munich and Mannheim, Germany, where he worked for Benz automobile factory; then went to Vienna, Austria, where he worked at Daimler as a test driver. In the autumn of 1913, Broz was conscripted into the Austro-Hungarian Army; in May 1914, he won a silver medal at an army fencing competition in Budapest. At the outbreak of World War I, he was sent to Ruma. He was arrested for anti-war propaganda and imprisoned in the Petrovaradin fortress. In 1915, he was sent to the Eastern Front in Galicia to fight against Russia. While in Bukovina, he was seriously injured by a howitzer shell. By April, the whole battalion was captured by the Russians. After several months at the hospital, Broz was sent to a work camp in the Ural Mountains in autumn of 1916. In April, 1917, he was arrested for organizing demonstrations of prisoners of war, but later escaped and joined the demonstrations in Saint Petersburg on July 16-17, 1917. He fled to Finland to avoid the police, but was arrested and locked up in the Petropavlovsk fortress for three weeks. After being imprisoned in a camp in Kungur, he escaped from a train. In November, he enlisted in the Red Army in Omsk, Siberia. In the spring of 1918, he applied for membership in the Russian Communist Party. In 1935, Tito travelled to the Soviet Union, working for a year in the Balkan section of Comintern. He was a member of the Soviet Communist Party and the Soviet secret police (NKVD). In 1936, the Comintern sent Comrade Walter (i.e., Tito) back to Yugoslavia to purge the Communist Party there. In 1937, Stalin had Secretary-General CPY Milan Gorkic murdered in Moscow. The same year, Tito returned from Soviet Union to Yugoslavia after being named by Stalin as Secretary-General of the still-outlawed CPY there. During this period, he faithfully followed Comintern policy, supporting Stalin's policies and criticizing Western democracies, fascist Italy and Nazi Germany. Origin of the name "Tito"
In 1920, he became a member of the soon to be banned Communist Party of Yugoslavia. Their influence on the political life of the Kingdom of Yugoslavia was minor at the time. In 1934, he became a member of the Political Bureau of the Central Committee of the Party, then located in Vienna, Austria, and adopted the code name "Tito." A popular explanation of the sobriquet claims that it is a conjunction of two Serbo-Croatian words, ti (meaning "you") and to (meaning "that"). As the story goes, during the frantic times of his command, he would issue commands with those two words, by pointing to the person, and then task. However, when Tito adopted the name, he was in no position to give orders because he was not the leader of the communist party, just a member. Tito is also an old, though uncommon, Croatian name, corresponding to Titus. Tito's biographer, Vladimir Dedijer, claimed that it came from the Croatian romantic writer, Tituš Brezovacki, but the name is very well known in Zagorje. On April 6, 1941, German, Italian, Hungarian and Bulgarian forces attacked Yugoslavia. The Luftwaffe bombed Belgrade and other major Yugoslav cities. On April 17, representatives of Yugoslavia's various regions signed an armistice with Germany at Belgrade, ending eleven days of resistance against the invading German Wehrmacht. The Independent State of Croatia was established as a Nazi puppet-state, ruled by the Ustaša, a militant wing of the Croatian Party of Rights, which split off from it in 1929, went into exile in Italy, and were therefore limited in its activities until 1941. German troops occupied Bosnia and Herzegovina as well as part of Serbia and Slovenia, while other parts of the country were occupied by Bulgaria, Hungary and Italy. 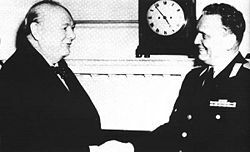 Tito did not initially respond to Germany's invasion of Yugoslavia on Stalin's orders because Stalin had signed the Nazi-Soviet non-aggression pact [source needed]. After Germany attacked the Soviet Union (June 22, 1941), Tito called (July 4, 1941) a Central committee meeting, was named Military Commander and issued a call to arms and communist revolution. Starting on July 7 in Bela Crkva, Yugoslav partisans began a widespread guerrilla campaign and started liberating chunks of territory. The activities provoked Germans into "retaliation" against civilians that resulted in mass murders (for each killed German soldier, 100 civilians were to be killed and for each wounded, 50). Tito recruited an ethnically mixed brigade, distancing himself from the ethnic cleansing and Nazi ideology of "superior" and "inferior" races to which the Ustaša subscribed. The Ustaša would declare Croatia Jew-free. In the liberated territories, the partisans organized people's committees to act as civilian government. 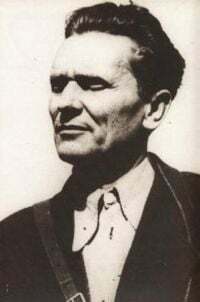 Tito was the most prominent leader of the Anti-Fascist Council of National Liberation of Yugoslavia - AVNOJ, which convened in Bihac on November 26, 1942 and in Jajce on November 29, 1943. In these two sessions, they established the basis for post-war organisation of the country, making it a federation. In Jajce, Tito was named President of the National Committee of Liberation. On December 4, 1943, while most of the country was still occupied by the Axis, Tito proclaimed a provisional democratic Yugoslav government. Tito's partisans faced competition from the largely Serbian Chetniks, who were long supported by the British and the royal government in exile. After the partisans stood up to intense Axis attacks between January and June 1943, Allied leaders switched their support to them. American President Roosevelt, British Premier Winston Churchill and Soviet leader Stalin officially recognized the partisans at the Tehran Conference. This resulted in Allied aid being parachuted behind Axis lines to assist the partisans. As the leader of the communist resistance, Tito was a target for the Axis forces in occupied Yugoslavia. The Germans came close to capturing or killing Tito on at least three occasions: in the 1943 Fall Weiss offensive; in the subsequent Schwarz offensive, in which he was wounded on June 9, being saved only because his loyal dog sacrificed himself; and on May 25, 1944, when he barely managed to evade the Germans after their Operation Rösselsprung airdrop outside his Drvar headquarters. The partisans were supported directly by Allied airdrops to their headquarters, with Brigadier Fitzroy Maclean playing a significant role in the liaison missions. The Balkan Air Force was formed in June 1944 to control operations that were mainly aimed at helping his forces. Due to his close ties to Stalin, Tito often quarreled with the British and American staff officers attached to his headquarters. On April 5, 1945, Tito signed an agreement with the USSR allowing "temporary entry of Soviet troops into Yugoslav territory." Aided by the Red Army, the partisans won the war for liberation in 1945. All external forces were ordered off Yugoslav soil after the end of hostilities in Europe. The remaining fascist Ustaša and royalist Cetnik troops and their supporters were subject to summary trials and executions en masse, particularly in the Bleiburg massacre and Foibe massacres. After the Tito-Šubašic Agreement in late 1944, the provisional government of Democratic Federal Yugoslavia was assembled on March 7, 1945 in Belgrade, headed by Tito. After the elections in November 1945, Tito became the Prime Minister and Minister of Foreign Affairs. In November 1945, a new constitution was proclaimed and Tito organized a strong army as well as a strong information bureau (the UDBA), in order to prevent Nazi collaborators' actions. The Communist Party won the first post-war elections under fair conditions, which united a country that had been severely affected by the war and successfully suppressed the nationalist sentiments of the peoples of Yugoslavia in favor of the common Yugoslav goal. In October 1946, in its first special session for 75 years, the Vatican excommunicated Tito and the Yugoslav government for sentencing Catholic Archbishop Aloysius Stepinac to 16 years in prison for cooperation with fascists and forcing the conversion of Orthodox Serbs to Catholicism. In 1948, Tito became the first Communist leader to defy Stalin's leadership of the Cominform; he was one of the few people to stand up to Stalin's demands for absolute loyalty. Stalin took it personally–for once, to no avail. "Stop sending people to kill me," Tito wrote. "If you don't stop sending killers, I'll send one to Moscow, and I won't have to send a second." The Yugoslav Communist Party was expelled from the association on June 28, 1948. This brought Tito much international recognition, but also caused a rift with the Soviet Union and triggered a period of instability often referred to as the Informbiro period. Tito's form of communism was labeled Titoism by Moscow, which encouraged purges against suspected "Titoites'" throughout the Communist bloc. The crisis nearly escalated into an armed conflict. On June 26, 1950, the National Assembly supported a crucial bill written by Milovan Ðilas and Tito about "self-management" (samoupravljanje): a type of independent socialism that experimented with profit sharing with workers in state-run enterprises. On January 13, 1953, they established that the law on self-management was the basis of the entire social order in Yugoslavia. Tito also succeeded Ivan Ribar as the President of Yugoslavia on January 14, 1953. On April 7, 1963, the country changed its official name to the Socialist Federal Republic of Yugoslavia. Under Tito's regime or Titoism, Yugoslavia also became a founding member of the Non-Aligned Movement. In 1961, Tito co-founded the movement with Egypt's Gamal Abdel Nasser and India's Jawaharlal Nehru, thus establishing strong ties with third world countries. For a period in the 1960s and 1970s, some intellectuals in the west saw Tito's model of market socialism as representing a point to which the Soviet and western economic systems would converge over time. The Yugoslav standard of living was somewhat higher than that of Eastern Europe, particularly because Yugoslavs were permitted to travel easily to Western Europe or other countries, bringing in money to support the economy. Tito's greatest strength, in the eyes of the western communists, had been in suppressing nationalist insurrections and maintaining unity throughout the country. It was Tito's call for unity, and related methods, that held together the people of Yugoslavia. This ability was put to a test several times during his reign, notably during the so-called Croatian Spring (also referred to as masovni pokret, maspok, meaning "mass movement") when the government had to suppress both public demonstrations and dissenting opinions within the Communist Party. 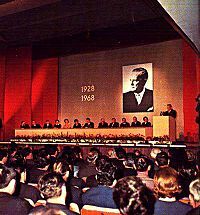 On May 16, 1974, a new Constitution was passed, and Josip Broz Tito was named President for life. In January 1980, Tito was admitted to Klinicni Center Ljubljana (the clinical centre in Ljubljana, Slovenia) with circulation problems in his legs, and his left leg was amputated soon afterwards. He died there on May 4, 1980, three days before his 88th birthday. His funeral drew many world statesmen. It was the largest funeral in history, based on the number of attending politicians and state delegations. Although bringing the Balkan region of Yugoslavia to an age of prosperity, this was short-lived after his death, and Tito's rule was certainly one cause of the dissolution of Yugoslavia and the ensuing strife within the states which emerged during the 1990s. Tito was notable for pursuing a foreign policy of neutrality during the Cold War and for establishing close ties with developing countries. Tito's strong belief in self-determination caused early rift with Stalin and consequently Eastern Block. His public speeches often reiterated that policy of neutrality and cooperation with all countries is natural as long as these countries are not using their influence to pressure Yugoslavia to take sides. 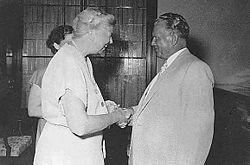 Relations with the United States and Western European nations were generally cordial. Yugoslavia had a liberal travel policy permitting foreigners to freely travel through the country and its citizens to travel worldwide. This basic right was limited by most Communist countries. A number of Yugoslav citizens worked throughout Western Europe. Because of its neutrality, Yugoslavia would often be one of the only Communist countries to have diplomatic relations with right-wing, anti-Communist governments (an example being Paraguay under Alfredo Stroessner). At the time of his death, speculation began about whether his successors could continue to hold Yugoslavia together. Ethnic divisions and conflict grew and eventually erupted in a series of Yugoslav wars a decade after his death. Tito was buried in a mausoleum in Belgrade, called Kuća Cveća (The House of Flowers) and numerous people visit the place as a shrine to "better times," although it no longer holds a guard of honor. 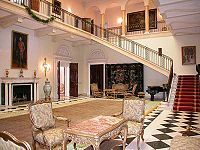 The gifts he received during his presidency are kept in the Museum of the History of Yugoslavia (whose old names were "Museum 25. May," and "Museum of the Revolution") in Belgrade. The value of the collection is priceless: it includes works of many world-famous artists, including original prints of Los Caprichos by Francisco Goya, and many others. During his life and especially in the first year after his death, several places were named after Tito. Several of these places have since returned to their original names, such as Podgorica, formerly Titograd (though Podgorica's international airport is still identified by the code TGD), which reverted to its original name in 1992. Streets in Belgrade, the capital, have all reverted back to their original pre-World War II and pre-communist names as well. However, some streets and squares in towns across the former Yugoslavia still retain his name. Beli Dvor was Tito's residence during his rule. Tito's first wife was Pelagija Broz (maiden: Belousova), a Russian who bore him a son, Žarko. They were married in Omsk before moving to Yugoslavia. She was transported to Moscow by the communists when Tito was imprisoned in 1928. His next notable relationship was with Hertha Haas, a woman of Jewish descent whom he met in Paris in 1937. They never married, although in May 1941, she bore him a son, Mišo. They parted company in 1943 in Jajce during the second meeting of AVNOJ. All throughout his relationship with Haas, Tito maintained a promiscuous life and had a parallel relationship with Davorjanka Paunovic, codename Zdenka, a courier and his personal secretary, who, by all accounts, was the love of his life. She died of tuberculosis in 1946 and Tito insisted that she be buried in the backyard of the Beli Dvor, his Belgrade residence. His best known wife was Jovanka Broz (née Budisavljevic). Tito was just shy of his 59th birthday, while she was 27, when they finally married in April 1952, with state security chief Aleksandar Rankovic as the best man. Their eventual marriage came about somewhat unexpectedly since Tito actually rejected her some years earlier when his confidante Ivan Krajacic brought her in originally. At that time, she was in her early twenties and Tito, objecting to her energetic personality, opted for the more mature opera singer Zinka Kunc instead. Not the one to be discouraged easily, Jovanka continued working at Beli Dvor, where she managed the staff of servants and eventually got another chance after Tito's strange relationship with Zinka failed. Since Jovanka was the only female companion he married while in power, she also went down in history as Yugoslavia's first lady. Their relationship was not a happy one, however. It had gone through many, often public, ups and downs with episodes of infidelity (Tito with another opera singer Gertruda Munitic, Jovanka with General Djoko Jovanic), and even allegations of preparation for a coup d'etat by the latter pair. Certain unofficial reports suggest Tito and Jovanka even formally divorced in the late 1970s, shortly before his death. The couple did not have any children. Tito's notable grandchildren include Aleksandra Broz, a prominent theatre director in Croatia, and Svetlana Broz, a cardiologist and writer in Bosnia. Though Tito was most likely born on May 7, he celebrated his birthday on May 25, after he became president of Yugoslavia, to mark the occasion of an unsuccessful attempt at his life by the Nazis in 1944. Nazis found forged documents of Tito's, where May 25 was stated as his birthday. They attacked Tito on the day they believed was his birthday. Tito spoke four languages in addition to his native Serbo-Croatian: Czech, German, Russian, and English. May 25 was institutionalized as the Day of Youth in former Yugoslavia. The Relay of Youth started about two months earlier, each time from a different town of Yugoslavia. The baton passed through hundreds of hands of relay runners and typically visited all major cities of the country. On May 25 of each year, the baton finally passed into the hands of Marshal Tito at the end of festivities at Yugoslav People's Army Stadium (hosting FK Partizan) in Belgrade. (May 25, 1977). Nineteenth-century Serbian peasant Mitar Tarabich made some uncannily accurate predictions for the nineteenth and twentieth centuries, some mention Josip Broz Tito. "Here, men with stars on their foreheads will appear. They will rule Uzice and this region for exactly 73 days, and then fleeing their enemies they will go over the River Drina. These are times of hunger and great evil…. Serbs will fight and butcher each other. The invading enemy looks upon Serbian evil hatred and laughs at us. A man with blue eyes on a white horse appears among our people. A star shines on his forehead. The evil enemy will hunt him all over our country, in the woods, over rivers and upon the sea, but in vain. The man will gather a mighty army and free occupied Belgrade. He will chase away the enemy from our country, and our kingdom will be bigger than ever. Russia will make an alliance with other great kingdoms over the seas, and they will burn down the crooked anti-cross and free all the enslaved people of Europe." 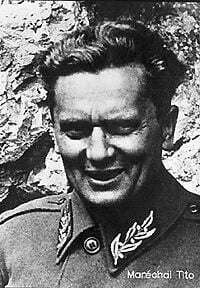 In Yugoslavia the Communist Party, led by Yugoslav communist Josip Broz Tito—the man with blue eyes on a white horse—started the resistance against the Germans and Italians as well as against the Serb and Croat nationalist extremists who were waging war against each other. The symbol of Tito's Communist Party was a red star, which they wore on their hats. The first territory liberated by Tito and his army was the region around the city of Uzice. They held it against German and Italian forces for exactly 73 days, and then Tito and his army were forced to flee over the River Drina to Bosnia. Guerrilla war was fought all over Yugoslavia. Barnett, Neil. Tito. London: Haus Publishing, 2006. ISBN 1904950310. Reviewed by Adam LeBor in the New Statesman, September 11, 2006. Carter, April. Marshal Tito: A Bibliography (Bibliographies of World Leaders). Westport, CT: Greenwood Press, 1989. ISBN 0313280878. Dedijer, Vladimir. Tito. New York: Arno Press, 1980. ISBN 0405045654. Djilas, Milovan. Tito: The Story from Inside. London: Phoenix Press, 2001. ISBN 1842120476. MacLean, Fitzroy. Tito: A Pictorial Biography. NY: McGraw-Hill, 1980 ISBN 0070446717. Pavlowitch, Stevan K. Tito: Yugoslavia's Great Dictator, A Reassessment. Columbus, OH: Ohio State University Press, 1992. ISBN 081420600X. Vukcevich, Boško S. Tito: Architect of Yugoslav Disintegration. Orlando, FL: Rivercross Publishing, 1995 ISBN 0944957463. West, Richard. Tito and the Rise and Fall of Yugoslavia. London: Sinclair-Stevenson, 1994. ISBN 185619437X. History of "Josip Broz Tito"
This page was last modified on 11 June 2018, at 21:35.